This formulation contains various nutrients and herbs that have been used to protect the functioning of the eyes. 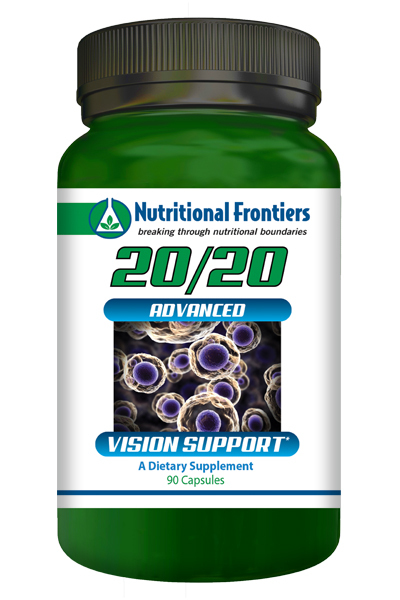 20/20 may be used by people with poor night vision, cataracts, macular degeneration, and hay fever or allergies that affect the eyes. Bilberry is used by humans for both medicine and food. Bilberry fruit contains anthocyanosides which help strengthen blood vessels, improve circulation, prevent platelet aggregation, and enhance rhodopsin production which improves night vision. British fighter pilots in World War II reportedly experienced improved night vision after regular ingestion of bilberry jam. Lutein, Zeaxanthin, and Astaxanthin are antioxidants in the carotenoid family. Lutein and Zeaxanthin are macular pigments found within the retina of the eye which protect the retina from damage caused by sunlight. Increased levels of macular pigment are correlated with decreased risk of age-related macular degeneration. Taking these antioxidant pigments as supplements correlates with increased levels of macular pigment measured in the retina and may also improve visual function. In a study that spanned 5 ophthalmology centers in the United States, the subjects eating the most lutein and zeaxanthin had a 57% decreased risk of macular degeneration. Quercetin is a member of the flavonoid family and is a prominent dietary antioxidant. Quercetin is used in age-related macular degeneration to improve cell membrane integrity and mitochondrial function, as well as reduce inflammatory mediators. It has also been studied for its ability to reduce fibrosis of the cornea in diseases like keratoconus. Quercetin plays a role in reducing allergies as well. Activin (grapeseed extract) contains a significant amount of proanthocyanidins. In one animal study, grape seed extract combined with zinc (also present in 20/20) prevented the formation and progression of cataracts. Furthermore, markers of oxidative stress were lower in the treatment group. Another study shows that grape seed extract reduced free radical damage and cell death in cells of the lens. N-acetyl-cysteine (NAC) is a precursor to glutathione, a powerful antioxidant. N-acetyl-cysteine has many medicinal applications such as in bronchitis and other lung diseases. It also plays a role in reducing oxidative stress in the cornea. NAC helps corneal cell survival and increases antioxidant markers in the eye. Vitamin E Recent research (2015) shows that Vitamin E intake either through diet or supplements, as well as high serum tocopherol (vitamin E) levels in the blood were associated with reduced risk of age-related cataracts. The Age- Related Eye Disease Study (AREDS) involving nearly 5,000 people, researchers found a 25 percent lower risk of developing advanced stages of AMD when a nutritional formula including vitamin E was taken. The AREDS supplement included 400 International Units (IU) of vitamin E, as well as high levels of vitamin A (as beta-carotene), vitamin C and zinc. Vitamin A actually is a group of antioxidant compounds that play an important role in vision, bone growth and health of the immune system. Vitamin A also helps the surface of the eye, mucous membranes and skin be effective barriers to bacteria and viruses, reducing the risk of eye infections, respiratory problems and other infectious diseases. Vitamin C High dietary intake of vitamins C and E were associated with a significantly reduced risk of cataracts or cataract surgery, according to research in Spain. ALA Powerful antioxidant. ALA scavenges free radicals and promotes regeneration of vitamin C and glutathione, which can in turn recycle vitamin E. ALA’s antioxidant properties are especially suited to preventing the diabetic complications arising from overproduction of reactive oxygen and nitrogen species, and ALA also promotes uptake of glucose. ALA May be protective of the lens of the eye, through antioxidant activity and delay development and progression of diabetes-related cataracts (rodent study). Other ingredients: Rice flour, silicon dioxide, hypromellose and water. Suggested Use: As a dietary supplement, take 3 capsules per day with meals, or as directed by your healthcare practitioner.